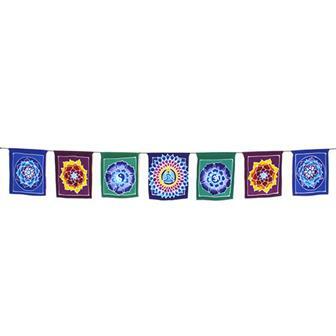 Here you will find our range of Fair Trade flags and bunting including life affirming prints, handmade batiks, chakra based hangings and Tibetan prayer flags to beautify and enrich your surroundings. 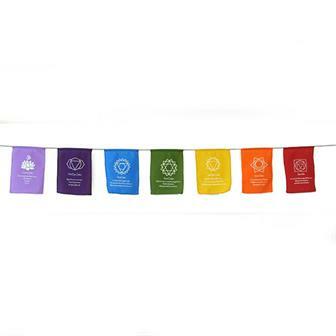 Large screen printed flags with the seven sacred chakra symbols and life affirming mantra in vibrant colours, these impressive sized flags have a wonderful silken texture, a fine detailed print, non-traditional hem to increase longevity and sturdy nylon string for hanging. 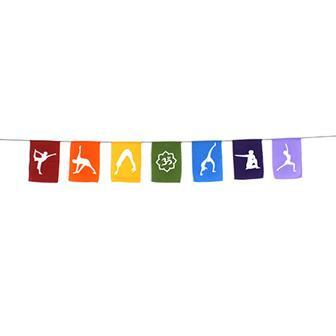 Bright, bold and colourful, these yoga bunting flags are perfect for stringing up in a yoga studio. 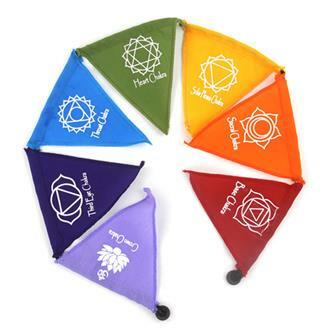 These beautiful flags have been screen printed with the seven sacred chakra symbols and a life affirming mantra in wonderfully bright and vibrant colours. 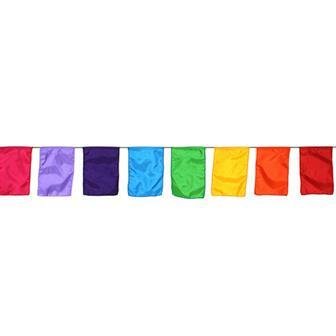 Often considered as prayer flags, they have a non-traditional hem to increase longevity and sturdy nylon string. 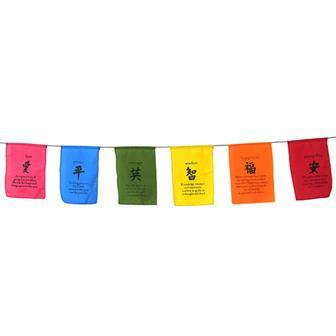 Bright and inspiring set of screen printed life affirming prayer flags made from silken rayon, hung on a length of sturdy nylon. 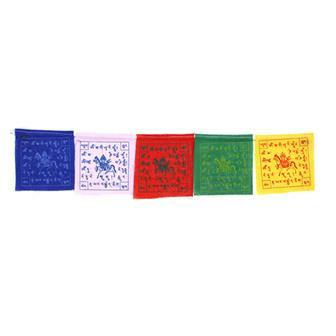 Each rich coloured flag is hand screen printed with a Feng Shui symbol and an inspirational mantra. Vibrant coloured bunting adorned with amazing mandala inspired artwork by Sophie Nina. 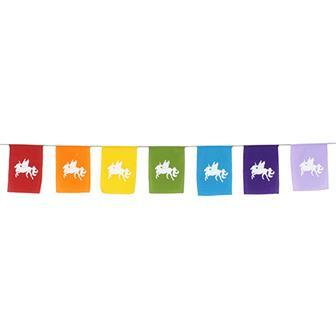 These amazing rainbow flags are perfect for brightening up any room or summer garden party. 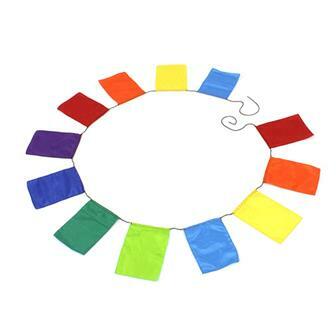 Simple and lovely vibrant flags in a mix of bold colours. Ideal for garden parties or to decorate a fairy abode. 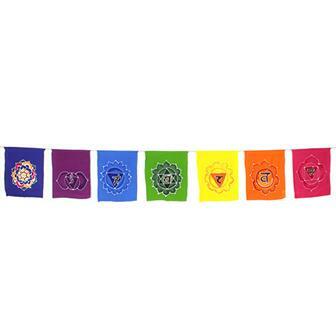 Inspiring batik mandala prayer flags in gorgeous expressive colours, these seven large flags feature beautiful handmade designs including images of someone in deep meditation, the lotus and Yin Yang. 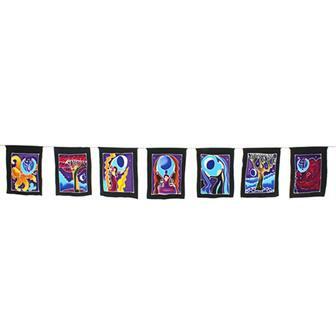 String of seven large vibrant Goddess batiks. The three central flags feature; The Maiden, the Mother and the Crone surrounded by other abstract symbolic images of nature and the Moon, each with a spiral Goddess. These wonderful neo-paganism batiks are all hand painted on silky feeling rayon, dyed with rich colours and strung on nylon. 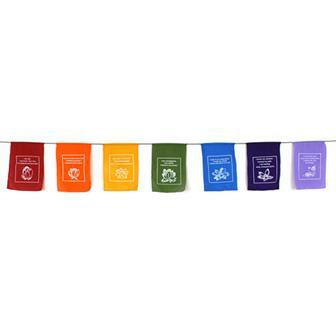 These bold and bright, contemporary prayer flags feature seven different spiritual and new age symbols. String of lovely sari off cuts and remnants remnants made into beautiful bunting. 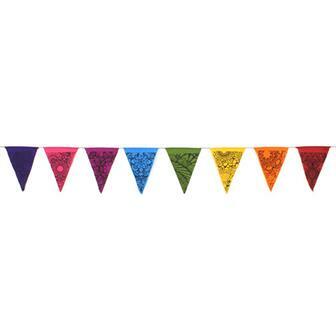 This bright and colourful affirmation bunting features seven triangular flags and two little magnets for attaching to the fridge or any other metal surface. 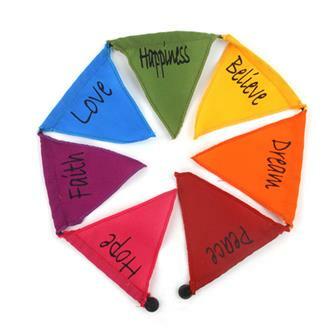 This bright and colourful affirmation bunting features seven triangular flags each with one of the seven chakras. 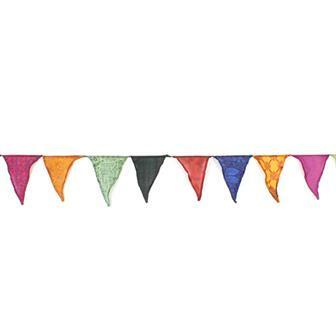 Each bunting has two little magnets for attaching to the fridge or any other metal surface. These miniature sets of prayer flags have a small magnet on either end of the string allowing the flags to be attached to the fridge door or anything metal. 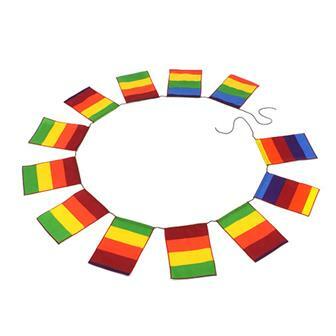 Each string has five colourful little flags. 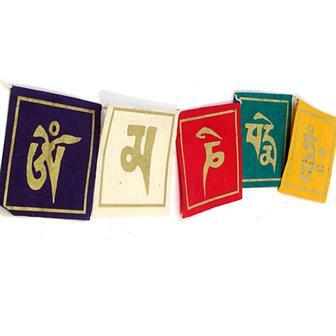 These sets of beautiful hand made paper prayer flags each have gold block print designs of the mantra Om Mani Padme Hum. Printed on recycled Lokta paper, these flags would look wonderful in any home or garden.